Home > News > News > Bring Your Group To The 2011 Christmas Show! Bring Your Group To The 2011 Christmas Show! Do you have a group or large family of 25 or more that’s looking for something different to do this holiday season? Why not consider tickets to The 2011 Christmas Show and a delicious meal at one of our local Pennsylvania Dutch restaurants before or after the show? 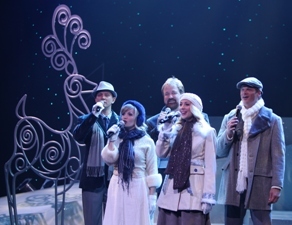 The all-new 2011 Christmas Show is set to open on Tuesday, November 1 and will feature classic and contemporary holiday music, wonderful winter scenes, and lots of family fun. Combine an amazing show with a tasty meal, and you’ve got a holiday event that’s sure to please. For a list of our participating local restaurant partners, click here. Our Reservations Staff will be happy to make all the arrangements for your group’s meal and show package. We’ll do the work, and you can take the credit! Don’t miss out on this great opportunity for your group of 25 or more. Call us today at 800-648-4102 or email sales@AMTshows.com.